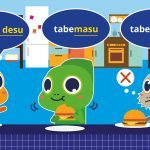 Do you know how to use said in Japanese? 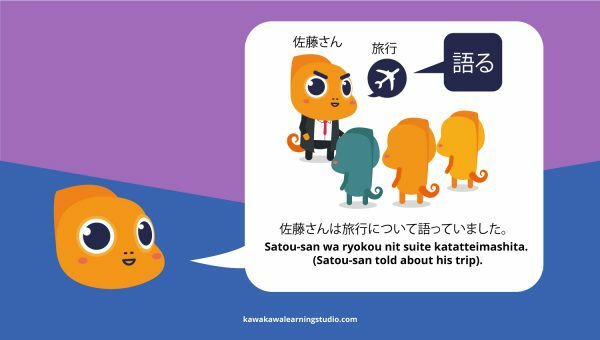 There are few verbs in Japanese used to express the concepts of “to say” or “to speak,”. And without context, it can be tough to know which one to use! In this article, we will be going over these verbs and looking at their differences, both in terms of meaning and usage. We will also go over essential sentence patterns for describing what someone has said, and in what way they have said it. The verbs we will be discussing are 言う iu, 話すhanasu, 喋るshaberu, and 語る kataru. You may encounter variations on this pattern depending on how casual the sentence is. Also whether additional qualifying words or descriptive words are included. But this is a good base sentence to start with. The particle “と to” between the quoted phrase and the “言う iu” verb indicates that the phrase is being quoted. You may have encountered the particle “と to” before with the meaning “with” (e.g. 友達と行きました, “I went with my friend”). But when “言う iu” followed “と to” it’s “with” meaning is not applied. Yamada-san wa 「roku ji ni kaigi ga aru」 to iimashita. Yamada-san said “it there is a meeting at 6 o’clock”. Note that when you are quoting or paraphrasing, use casual/short form verbs and copulas when speaking or writing the sentence or phrase. The politeness level of the final verb in the sentence largely determines the politeness level of a Japanese sentence. So as long as the “言う iu” is in -masu form (“iimasu”), the overall sentence will remain polite. Even though the verbs and copulas within the quoted phrase are in casual/short forms. Plus, using -masu form in writing verbs and copulas in the quoted phrase can make the sentence stiff and overly long. Also note also that the quotation particle “と to” is often pronounced “っと tte,” particularly if the rest of the sentence around the quotation is phrased casually. Yamada-san wa 「roku ji ni kaigi ga aru」 tte itta. One additional use for “と言う to iu” is to tell someone what the name of a person or thing is. I am called Lily. (Note that “iimasu” does not literally mean “called” in the English sense of “to be called” (a passive tense sentence) here, although it can be used to express the same idea). 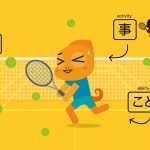 “Cat” wa nihongo de nan to iimasu ka? 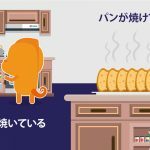 What is “cat” in Japanese? Another use for “言う iu,” when directly preceded by the expression “ように you ni” rather than the particle “と to,” is to express the idea of someone told to do something. My mom told me to do my homework. Occasionally, you may run across “と言うto iu” in the middle or latter half of a sentence rather than at the end of the sentence. In these cases, the “と言うto iu” only uses hiragana rather than a mix of hiragana and kanji. It is used to mean something similar to the English “called” or “like” rather than being used to indicate a quotation or paraphrasing. I read a book called “Toto-chan (again, note that “と言うto iu” does not literally mean “called,” although it is expressing the same concept). Jibun no te de se-ta- o amu toiu koto wa hontou ni muzukashii desu ne. To knit a sweater with one’s own hands is truly difficult, huh? 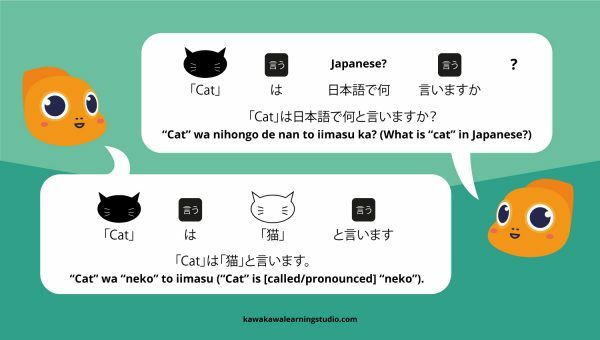 Japanese has two relatively common verbs meaning “to speak” or “to talk.” These are “hanasu” and “shaberu.” Depending on the situation, they can also mean “to chat.” These verbs are frequently interchangeable. He is talking in Spanish. I talked with my friend on the phone for many hours. You should speak to your boss. I want to speak to Mr. Brown. “Kataru” is more of a literary word than a spoken one, and when “kataru” is interchanged with “hanasu” in spoken (or written) Japanese it can make the sentence sound more formal, literary, or even proverbial. 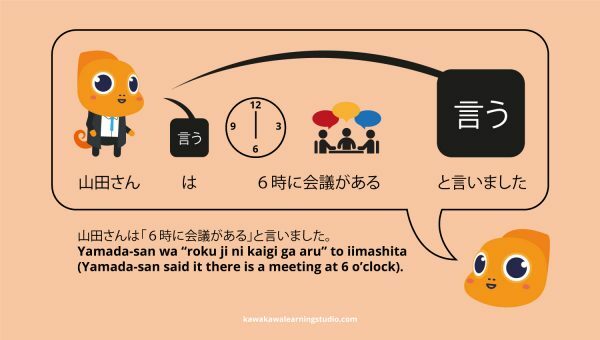 While “kataru” can be interchanged with “hanasu” in many situations, bear in mind that it also carries more of a nuance of “tell” than the other “speak” verbs; and you may find it used more frequently to describe one person who is talking, lecturing, or telling a story to another person or group of people (as opposed to two or more people all talking amongst each other) compared with the other “speak” verbs. Satou-san told about his/her trip. Similar to “hanasu” and “shaberu,” “kataru” can also be used in its noun form (“katari,” 語り). It means “a talk” or “a narration.” It is more common, though, to see its noun form in compound words such as “monogatari” (meaning “tale”. For instance in the Japanese title of “The Tale of Genji”: Genji Monogatari 源氏物語). 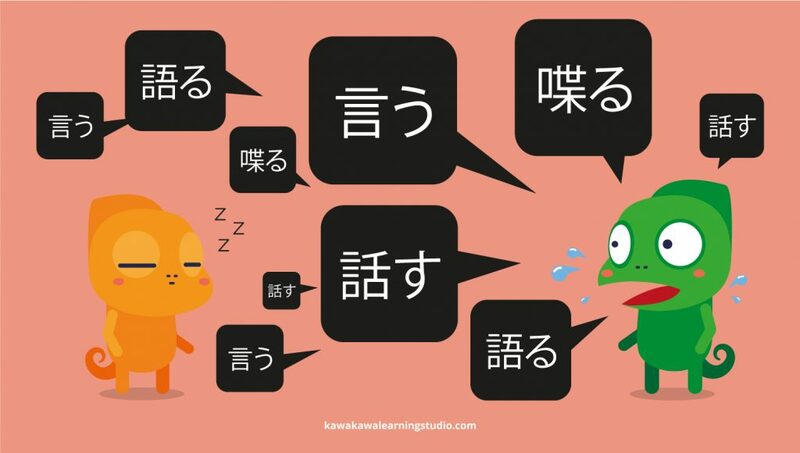 And that is the end (for now) of our article on Japanese verbs for “to say” or “to speak”! I hope that you find it to be helpful. If you have any questions about this article or these verbs, or if you have any suggestions for future Japanese grammar article topics, make sure leave a comment and let us know!